Amy Poehler is one of the most versatile and sought-after talents in Hollywood today. Famous for her role as Leslie Knope on “Parks and Recreation,” she was one of the biggest stars on “Saturday Night Live” in the 2000s. Today, she helms many of her own projects through her production company, Paper Kite Productions, and serves as an executive producer, author, host and humanitarian. Few public figures have careers that so clearly reflect authenticity and the drive to follow their hearts as Poehler. She developed her skills in improv comedy, an arena where she could say whatever came to mind and act without a script. As a comedic actress, she made a name for herself by fearlessly pushing the limits of humor and leaning into memorable characters. In addition to her acting career, Poehler is the founder of “Amy Poehler’s Smart Girls at the Party,” an online and in-person community offering resources to help young women cultivate their most authentic selves. Poehler recalls the joy of being accepted for who she was as a young girl and founded the organization to empower other girls to feel the same way. “Smart Girls at the Party” emphasizes “intelligence and imagination over ‘fitting in’” and embodies Poehler’s vision that embracing authenticity can transform individuals, organizations and, eventually, the world. So how does this fit in with hiring? Poehler has conquered new territory in production, publishing and tech by being unafraid to learn and change. When it comes to hiring, both employees and organizations must cultivate these qualities to find their right fit. Like many industries, the recruiting world is constantly changing, and adaptability and authenticity are key for those on both sides of the hiring equation. It can be difficult to determine which candidate is the best fit for a role — but when job seekers are being their authentic selves and organizations are clearly expressing and embodying their cultural values and missions, the right matches will follow. Come join us, and explore just why authenticity matters, at Indeed Interactive with Amy Poehler. But that’s not all. 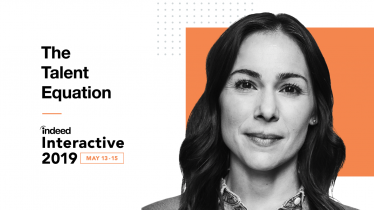 This year at Indeed Interactive nearly 2,000 global talent leaders will join us to explore “The Talent Equation” and discover how to master the variables of hiring success (hint: encouraging authenticity in the workplace and ensuring your organization embodies its authentic brand go a long way to help). Attendees will have plenty of opportunities to hear inspiring presentations from other soon-to-be-announced talent and thought leaders, participate in compelling breakout sessions and network while enjoying the best that Austin, Texas, has to offer. In other words, Indeed Interactive is going to be bigger and better than ever. In fact, it’s going to be so big that this year we’re hosting the conference in our biggest venue to date — the Austin Convention Center, which is home to many of Austin’s premier events such as the annual South by Southwest (SXSW) tech conference. We’ll be announcing more speakers soon, and we can’t wait to share the session agenda with you in January. Keep an eye out for more exciting news to come!